Unknown Maker, American. Gold Miners with Sluice, ca. 1850. Daguerreotype, quarter plate, image size: 3 ¼ x 4 ¼ inches. Gift of Hallmark Cards, Inc., 2005.27.116. Platt D. Babbitt, American (1822-1879). Group at Niagara Falls, ca. 1853. Daguerreotype, whole plate, image size: 6 ½ x 8 ½ inches. Gift of Hallmark Cards, Inc., 2005.27.249. Work by David Emitt Adams waiting to be unpacked for the exhibit "Five Alchemists: Contemporary Photographers Explore 19th-Century Techniques"
The only light comes from dozens of dimly lit photographs, ranging in size from baseball cards to coffee table books. As you make your way from one display to the other, the reflections in the copper plates change, giving the effect of movement. A daguerreotype is an early form of photography. Its process is a complex and expensive one. It requires halogen and mercury fumes, exposure to light and lot of patience. The result is a black and white image, which today provides a window into 19th-century America--there are faces of explorers, a circus clown and families posing for stiff portraits. This collection captures life—patrons waiting at a butcher shop, grizzly men sifting for gold in a mountain stream. Unlike photographs printed on paper, which fade and yellow over time, these images have remained crisp and still look perfectly polished. Volpe describes one of her favorites; an image by Robert H. Vance that depicts about dozen, sharply dressed men posing on a street corner. “'Great Man Has Fallen,'" Volpe reads. "This is in San Francisco" mourning the death of James King of William. The exposure times for daguerreotypes depend on available light. But, even on a clear day it could’ve taken 10 seconds or more to capture an image. In the case of "The Great Man Has Fallen," it blurred the movement of a man in a white coat, leaving an eerie, ghostlike trail. The daguerreotype process was invented in France by Louis Daguerre in about to 1835. It traveled to the U.S. quickly. "At the very beginning, it is a hobby for the wealthy,” Volpe says. 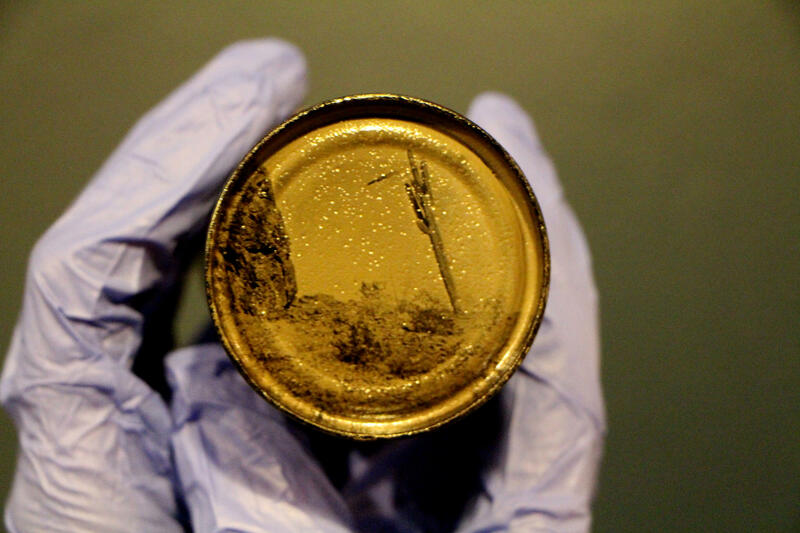 “When Daguerre first announces his process in France, within a month there are Americans trying it out for themselves." Some of those who stuck with Daguerre’s process eventually opened up studios with their names plastered on the front. 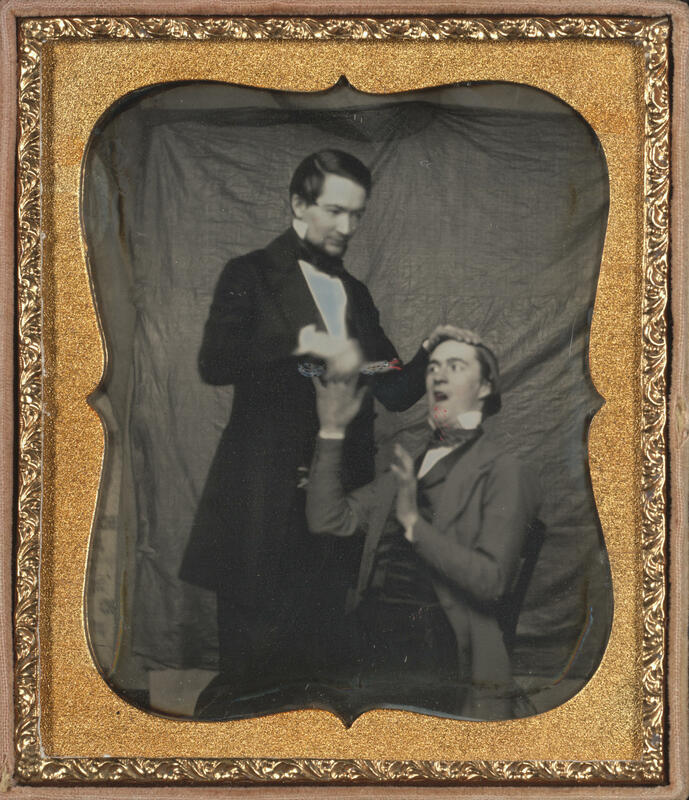 These daguerreotypists were often known far and wide for their talents. 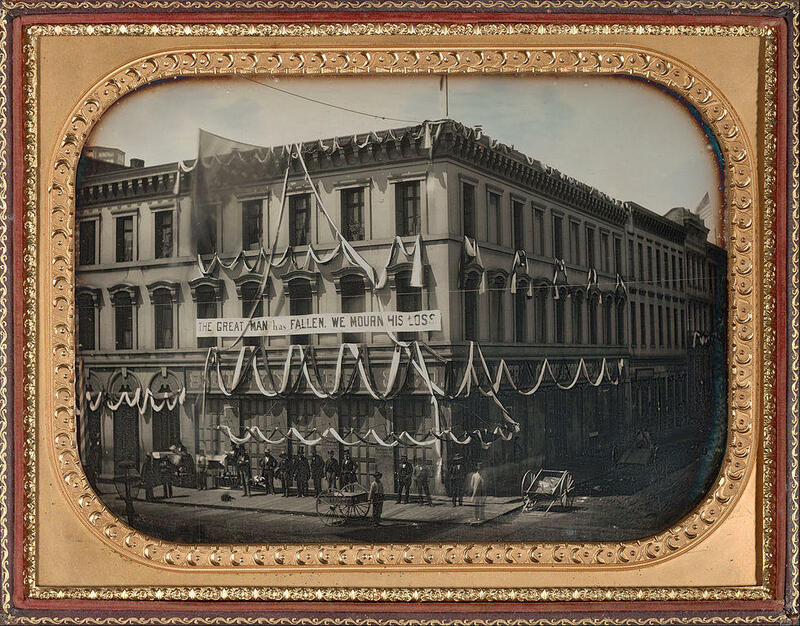 Photographic film can produce multiple prints from one negative, but daguerreotypes were one-of-a-kind. They were treasured personal tokens, often displayed in ornate carrying cases. Stitched velvet and gold framework envelope many of the 82 pieces in this collection. Clustered on a wall of the dimly lit gallery are a group of images of young children. A tragic, but common portrait to have done in the mid 19th-century is that of a deceased child. A girl, no older than a year, is seen in her crib. She lies on her back with her eyes closed. “These are the post-mortem images, which were usually a smaller size so that they can be kept with the mother," Volpe says. “The idea was to show them asleep—not necessarily dead—to be able to have an image to keep with you." Volpe says this collection of daguerreotypes presents a stark contrast to the way today’s society interacts with photography. Volpe's comment relates nicely to a different exhibition being unpacked two floors below. It includes the work of five contemporary photographers using techniques long forgotten. Volpe unwraps the artwork to reveal work by David Emitt Adams, who hails from Phoenix, Arizona. 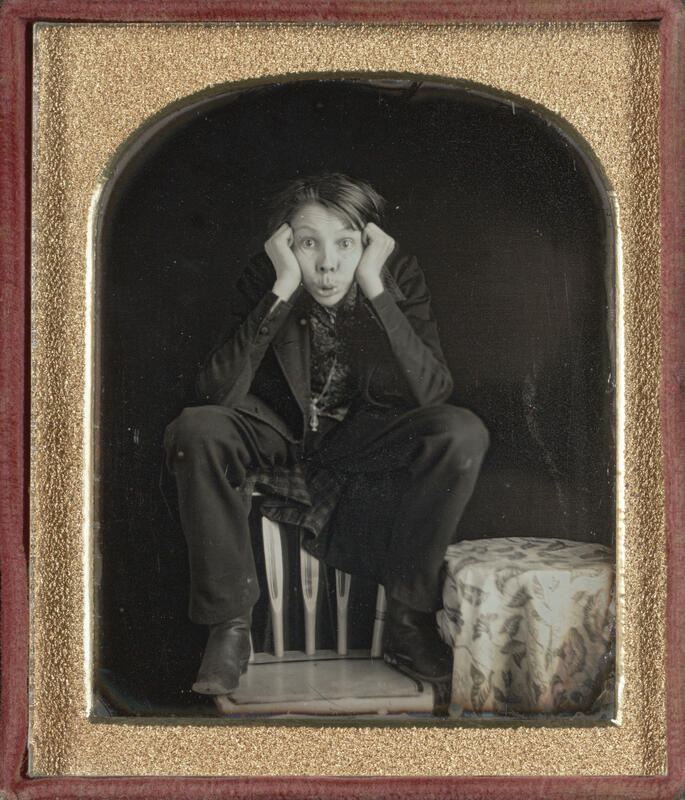 He’s made a name for himself by using a 19th-century photographic process called wet-plate collodion, which eventually replaced daguerreotypes because it was less expensive and a bit easier. Adams has found a unique way of using this process. Volpe removes some of his artwork from inside the box. The results are faint, black and white images--the subject matter linked to the very object its printed on. 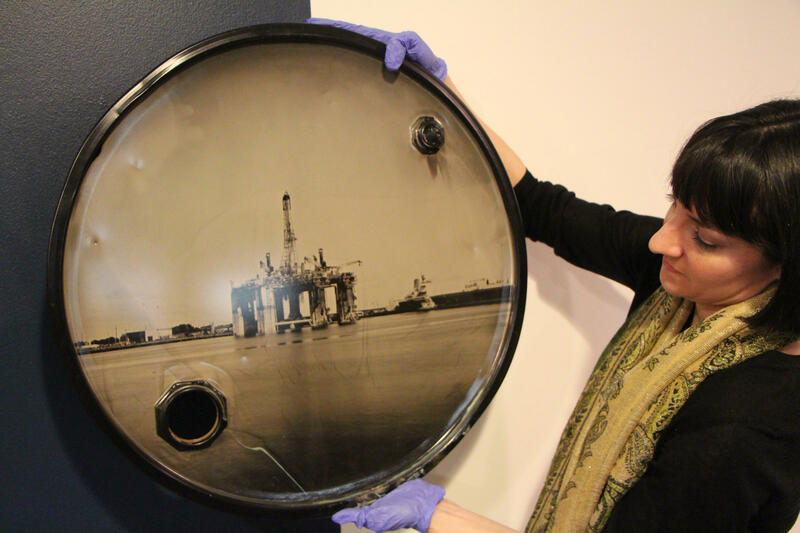 Beside these oil drum lids sit some of Adams' smaller work. “These are rusty tin cans that he’s collected from the Arizona desert,” Volpe says. “And wherever he found the can, he took a photograph. And then he puts the photo on the can." The desert landscapes, which feature a cactus, boulders and electrical lines, are printed in a way that they look like natural occurrences from rust and wear. Adams' work will join the images of four other photographers. "Five Alchemists: Contemporary Photographers Explore 19th-Century Techniques" will run concurrently with the 150-year old daguerreotypes upstairs.